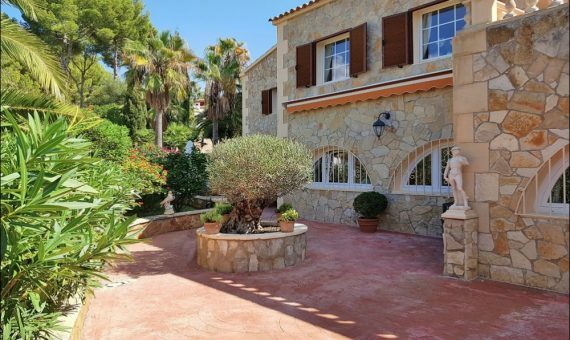 Recently renovated luxury villa in Nova Santa Ponca, in a residential area in the south-western part of Mallorca. The plot of more than 1.300 sqm has a large swimming pool, surrounded by a sunny patio with a lounge area, a well-groomed garden with lawn and various Mediterranean plants and trees, and a garage for 2 cars with electric gates. The spacious living area of 441 sqm is divided between 2 floors and offers a magnificent hall, cozy bright living room with fireplace, American kitchen with dining area, 2 bedrooms with bathrooms en suite, a guest toilet, and a separate guest apartment with living room, kitchen, 2 bedrooms, and bathroom. Several terraces – a perfect place to spend there days of relax or a have fun in a good company, are an excellent addition to the house. And from the terraces on the upper floor you may enjoy wonderful views over the landscape. The property was recently refurbished, tastefully furnished, and equipped with air conditioning, marble floors with heating, PVC windows with double glazing, Sat-TV, BBQ, and much more. The villa is located in a popular residential area, consisting mostly of luxury houses, which guarantees a desired and peaceful neighbourhood. Santa Ponsa and Port Adriano with their sandy beaches, marinas, restaurants, supermarkets, and all the necessary services, as well as entertainment and sports centers are located very close.